Western blot analysis of extracts from Jurkat cells, serum-starved overnight and pretreated with the indicated amounts of SB202190 for 1 hr, and subsequently treated with anisomycin (25 µg/ml, 30 min), using Phospho-p38 MAPK (Thr180/Tyr182) (D3F9) XP® Rabbit mAb #4511 (upper) or p38 MAPK Antibody #9212 (lower). 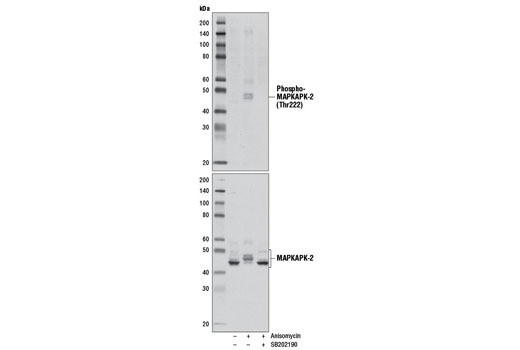 Western blot analysis of extracts from Jurkat cells, serum-starved overnight and pretreated with SB202190 (10 µM, 1 hr), and untreated or treated with anisomycin (25 µg/ml, 30 min), using Phospho-MAPKAPK-2 (Thr222) (9A7) Rabbit mAb #3316 (upper) or MAPKAPK-2 Antibody #3042 (lower). 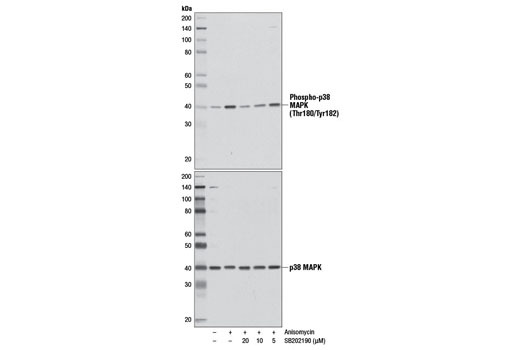 MAPKAPK-2 is a specific downstream substrate of p38 MAPK. SB202190 is supplied as a lyophilized powder. For a 10 mM stock, reconstitute the 5 mg in 1.51 ml DMSO. Working concentrations and length of treatment can vary depending on the desired effect, but it is typically used as a pretreatment at 5-20 µM for 1-2 hours prior to treating with a stimulator. Soluble in DMSO, solubility in other solvents has not been evaluated. 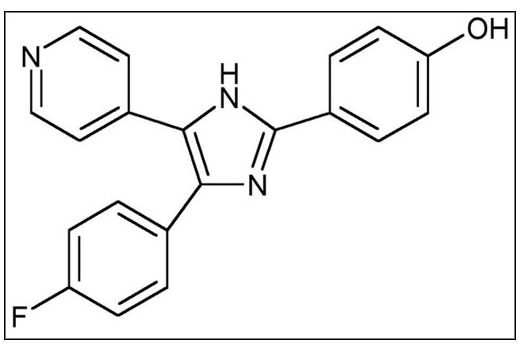 SB202190, a pyridinyl imidazole, inhibits p38 MAP kinase activity through competition with ATP (1), and has been shown to induce apoptosis through activation of cysteine protease (CPP32)-like caspases (2). SB202190 blocks both lipopolysaccharide (LPS)-induced gene expression and nitric oxide (NO)-induced stabilization of interleukin (IL)-8 mRNA in monocytes (3,4). Pre-treatment of cells with SB202190 has been shown to inhibit phosphorylation of p38 MAPK despite exposure to anisomycin, a known inducer of the MAPK pathway (5). Of note, the mechanism of inhibition of SB202190 is unlike the one seen with SB203580, which inhibits p38 MAPK catalytic activity by binding to the ATP binding pocket, but does not inhibit phosphorylation of p38 MAPK by upstream kinases (6). Young, P.R. et al. (1997) J Biol Chem 272, 12116-21. Nemoto, S. et al. (1998) J Biol Chem 273, 16415-20. Manthey, C.L. et al. (1998) J Leukoc Biol 64, 409-17. Ma, P. et al. (2004) J Leukoc Biol 76, 278-87. Geiger, P.C. et al. (2005) Am J Physiol Endocrinol Metab 288, E782-8.